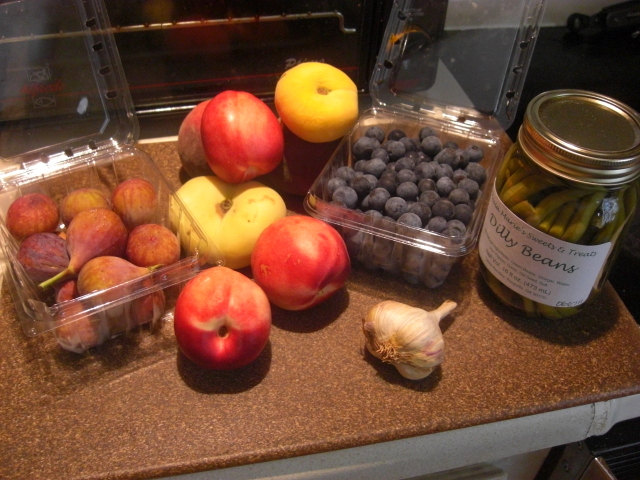 7/27 corn, tomatoes, figs, and blueberries! The corn has been tremendous this year! And so easy, too. Just toss a couple of ears, husk and all, into the microwave and cook 2 x 2 minutes. The ears will be too hot to handle, but after a minute, they’re easy to shuck and desilk. And good enough not to need butter or pepper. It’s practically a convenience food. 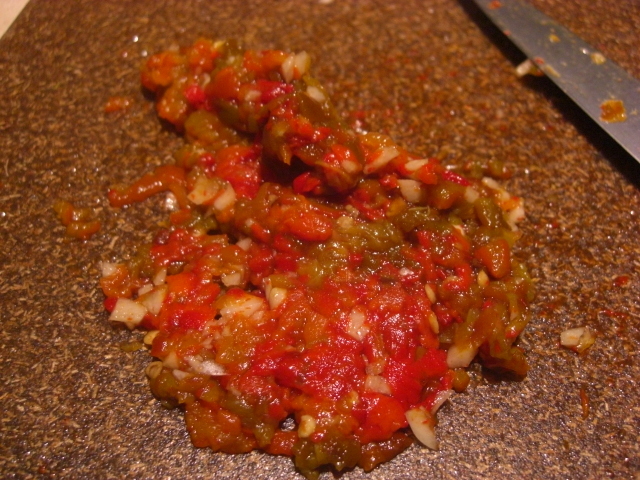 Got it in my head to make a roasted pepper relish – mainly from a recipe from The Commonsense Cookbook. I like this cookbook because it’s from a kitchen that feeds 18-20 year-old men who spend half their days doing farm work. These recipes are loaded for bear. No skim milk or ground turkey breast in sight. I usually keep the recipes as they are and cut way back on the quantity. Of course, sweet pepper relish doesn’t have much in terms of calories or cholesterol. I started with the three peppers and a bulb of garlic. 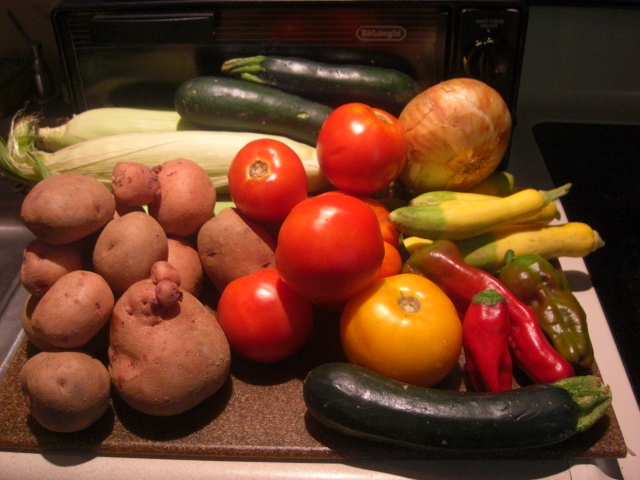 The easiest way to roast a pepper is over a gas stove. However, my stove is electric, so I had to resort to the broiler. Actually, I resorted to the toaster oven broiler. It didn’t work great. It took a long time to get any blackening of the peppers. And by the time they were getting close, two of them had popped leaving me with pepper juice in my toaster oven. So I pulled them out early, sweated, skinned, and chopped them. I wish I’d left more of the seeds in. Still, the results were pretty good. 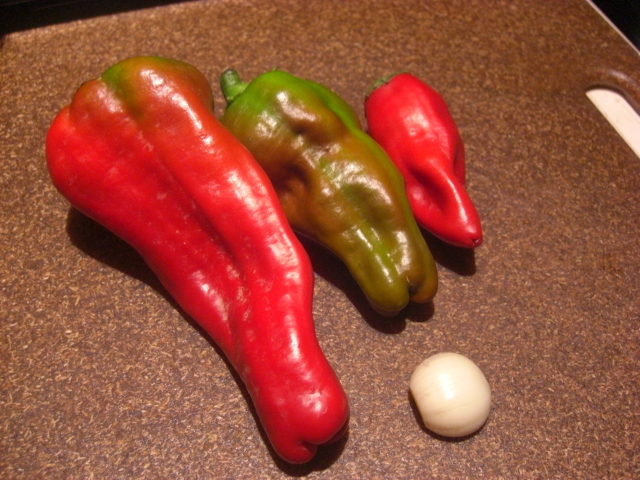 Interestingly, although these are “Italian” peppers, they have a very Southwestern taste to me. I can’t imagine using this to spice up an Italian dish. So I bought some sour cream, tortillas, and a can of refried beans, and we’ll have some kind of burritos this week. Tonight we’re going to go Italian with tomatoes, garlic, zucchini, Anson Mills polenta, and Georgia shrimp. And lots of olive oil from I’m not sure where. I know the wine’s from Argentina! The plan is to slowly cook chopped tomatoes, zucchini, and garlic with olive oil and some wine. I’ll see what kind of herbs I can score from my neighbor’s garden, too. I think we’re out of pasta. (I’d check, but if we really are out of pasta, I’d rather not know. I’ve ordered some from Amazon, and it should be here next week.) So instead of eating a tomato concoction with pasta, I’m going to use the Anson Mills polenta that’s been languishing in the fridge. As far as I can tell, polenta is pretty much grits, and grits call for shrimp. Looking forward to supper and its preparation. I enjoy weekend cooking that’s slow and simple. The polenta can cook slowly, the tomatoes can cook slowly. I can wander in and out of the kitchen slowly. There’s no rush, and we eat (well) when it’s done. Stir-fry zephyr squash; possibly add chopped squash to the above pie. For stir-fried squash, I’ve taken to mixing the veggie ingredients and cornmeal before adding them to the melted butter in the pan. It works a lot better. Make mini-cobblers with peaches and nectarines. Make fig compote. Fresh figs are good but kind of gushy. Freeze blueberries and add to yogurt for a great cool snack. Use Dilly beans in place of coleslaw for lunch.